Grey seals have different personalities that dictate how they nurture and protect their young, a study reveals for the first time. Mother seals in Scotland choose very different approaches to nurture and protect their pups according to their personality, say researchers from two UK universities. Even when circumstances change, the seals maintain their style of behaviour, the researchers from Durham and St Andrews universities have discovered. The study's lead author, Dr Sean Twiss, of the School of Biological and Biomedical Sciences at Durham University, says, "Our findings show that there is no such thing as an average seal. Individuals behave differently and do so consistently. We found that some seal mothers are very watchful when something potentially threatening approaches them, while other mums barely check their pups at all. 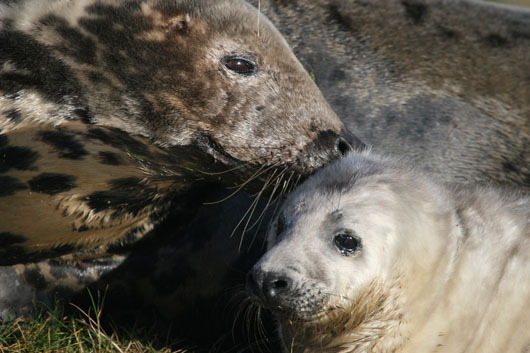 "Why female grey seals express individually consistent patterns of pup checking is unknown. It might be expected that females should be able to change their behaviour according to the situation but the non-attentive mothers remained inattentive. Our results show large differences in response to the same potential dangers." The study findings, which reveal more about the evolutionary process, are being presented to the 19th Biennial Conference on the Biology of Marine Mammals conference in Tampa, Florida, which takes place from 27 November to 2 December. The grey seals on the island of North Rona were studied throughout the three-month breeding period from September for two years running. Researchers used a remote controlled vehicle to discover how female grey seals reacted to threats when approached and played 11 minutes of recorded wolf calls. There was a range of reactions, from aggressively pushing it with their muzzles to disinterest, but the reasons for why this happens is unclear, the team says. The number of pup checks - when the mother lifts her head to check if the young are safe - was recorded. As many seals returned to breed, and are easily identifiable from their fur patterns, this could be carried out over both years. Male grey seals also had differing reaction, ranging from using open-mouthed threatening behaviour to quickly retreating. None of these measures in either males or females was due to age or size, the study found. Dr Twiss adds, "We can see that grey seals are individuals and we want to find out if having different personalities and behaviour helps seals and other animals in the wild, or whether it does limit their ability to cope with change." The report's co-author, Dr Patrick Pomeroy, from the Sea Mammal Research Unit, at the University of St Andrews, says, "Our results show strong consistencies in behaviour of wild seals. If maternal attentiveness contributes to fitness, one would be forced to ask why selection has not favoured a single optimum level of pup checking, or flexibility in terms of the number of checks made. Our next task is to find out if personality differences have fitness consequences." The Esmee Fairburn Foundation and the Natural Environment Research Council (NERC) financed the study. The world's total population of grey seals is about 460,000. Around four out of ten live in the UK's coastal waters. Other large populations are in Canada and America.